BK Bulletin – January 2019: Already…ugh! Instead of going out New Year’s Eve, which is pretty much impractical for us right now, Alison and I (thanks to her sister Amy, and her parents for watching the kids!) planned a rather ambitious day of things on Saturday, December 29. 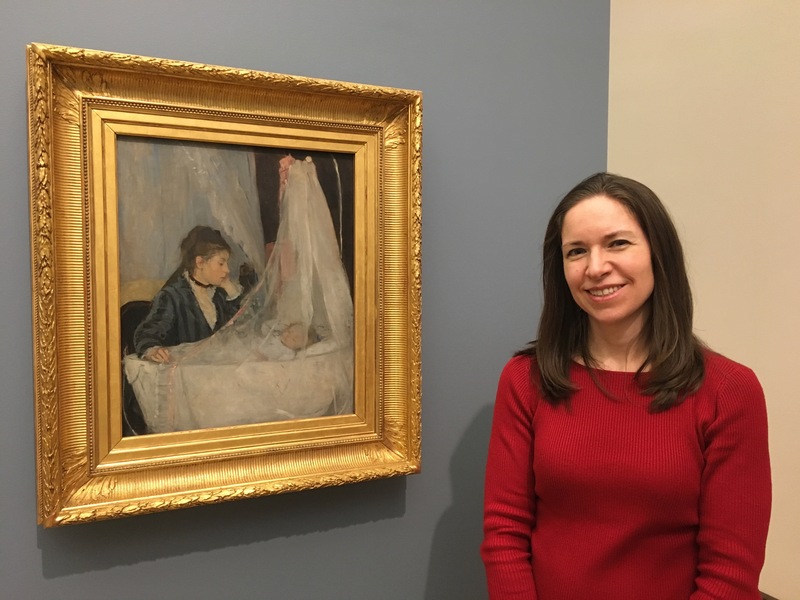 First, we spent the afternoon at the Barnes Foundation in Philadelphia to see the special exhibit “Berthe Morisot: Woman Impressionist” before it ended this month. One of Morisot’s best-known paintings is “The Cradle,” which normally resides in the Musee d’Orsay in Paris, but was included in the Barnes exhibit. “The Cradle” is also featured in the children’s book My Little Orsay, which we used to read to our son Graham at bedtime when he was younger, so I took a photo of Alison next to the painting so he could see it (above). 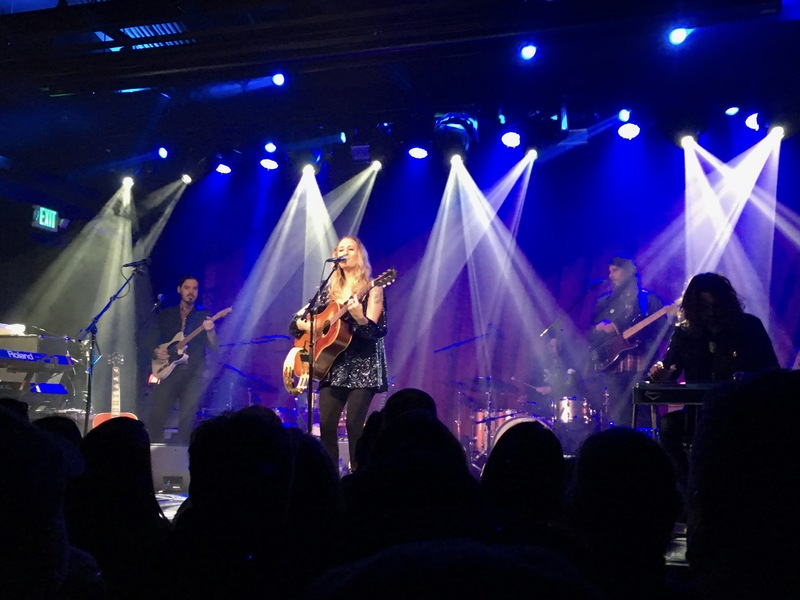 After a few hours at the Barnes, we drove about an hour and a half to Eatontown, N.J., for dinner before seeing Margo Price at Asbury Lanes in Asbury Park. Now, before I go any further, I should mention that I was not feeling all that great. I thought I was dealing with a typical cold. But as the day went on, it became clear this was not the case. Honestly, I don’t know how I managed to drive all the way to the Jersey Shore because as soon as I exited the car, I stumbled and realized I was freezing and kind of nauseous. We had a gift card to Olive Garden so that’s where we had decided to go, but I wasn’t really up for eating at that point. I tried some soup and breadsticks, but I ate very little. 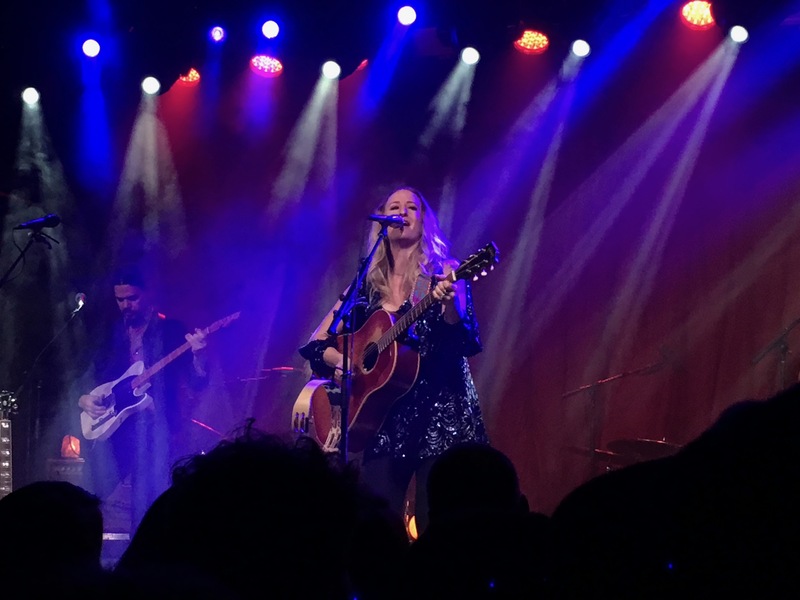 I was feeling pretty miserable, but was determined to see at least part of the Margo Price show. This may be TMI…but let’s just say there was an episode by some bushes in a corner of the parking lot as we were leaving the restaurant and I felt a little bit better after that. But there was this seemingly endless stream of nasal drip and mucus and who knows what else, and there were only so many tissues I could have on hand. But we did manage to see most of Margo Price’s set (we started leaving as she performed the last song before the encore). 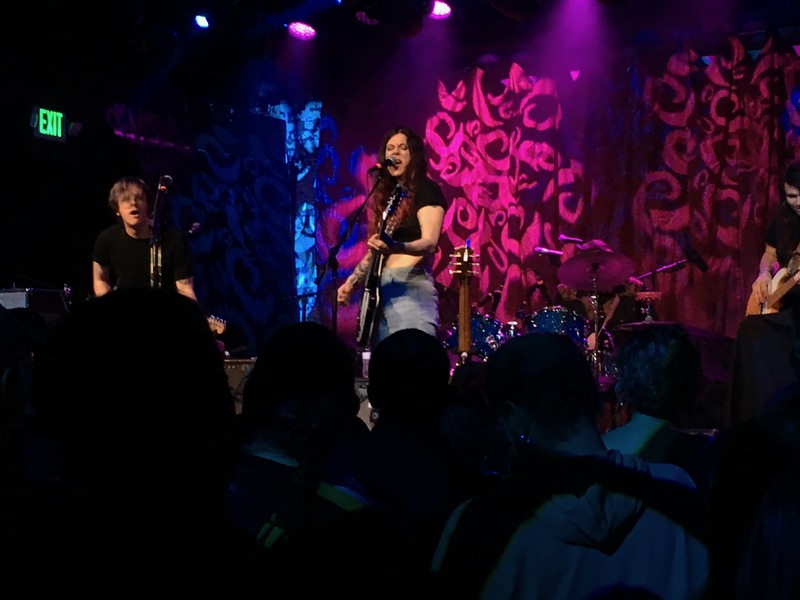 I just couldn’t take any more…which was a shame because Margo and her band were so, so good (as was opener Lilly Hiatt). Below are a few photos I took during the show (first two of Margo, and the third of Lilly). And below that is a YouTube video of Margo performing what is possibly my favorite song of hers, “Four Years of Chances,” which also shows off Margo’s drumming prowess. And just to tie up loose ends…I wound up going to an urgent care facility on New Year’s Day and that’s where I received the sinusitis diagnosis. I’m not really sold that’s what it was, though, because it disregarded my fever and chills. But I did get antibiotics out of the deal and that’s what I was looking for at that point. Despite the fact that I don’t think of myself as any real kind of musician, I am constantly envisioning musical pieces in my head. Most of the time, those ideas fade away into a deserved oblivion (because they are bad ideas). Sometimes, they stick and I carry through with turning them into reality. Recently, I sat down at the out-of-tune piano in our house and played a few chords. I quickly came up with verse and chorus parts, and almost immediately envisioned a complete song in my head. I wanted to record the parts in GarageBand on my Mac, but was sidelined by the supposed sinus infection. So, instead, I sketched out the parts in GarageBand on my iPhone from my bed to keep the momentum going. Regarding the musical direction of the song, it is very much influenced by Los Angeles band Lo Moon, who I have been obsessed with for the past year and a half. There’s also a bit of Keane in the choruses. Once I had the music set and recorded, I quickly wrote some lyrics. Most of them came from improvisation, including the title, but the conflict depicted was initially influenced by an article I was reading about how many of the victims of the Camp Fire in Paradise, Calif., were basically defeated by flames, geography and flawed city and emergency planning. That version of the lyrics got real dark real quick, so I adapted the subjects of the song to be a couple in turmoil who rally together to take on less-specific external forces working against them. I’m not sure if the lyrics are completely set in stone, but they do the job for now. Once they were written, I quickly recorded the vocals. Yeah, I wish they could be better, but I’m not going to spend days “perfecting” them for a demo. That said, I’m rather pleased how this all came together. It’s definitely one of the better songs I’ve ever written. Maybe someday I’ll do something with the catalog of songs I’ve written over the past three decades…it’s kind of a bucket-list item. Curiously, as I was working on this song, my friend Christian Beach emailed me and wrote that he had a dream in which I was playing him demos of new songs and that there was one he really liked and picked out as “the single.” He woke up and thought about humming the song into his phone, but didn’t and went back to sleep. When he eventually woke up for the day, he couldn’t remember what the song sounded like, but said he pictured it as “triangular.” I’m not entirely sure what shape this song is, but it was weird that he had a dream about me creating new music as I was actually in the process of writing my first new song in years (not just working out ideas and concepts as I have been doing). A reminder that I am once again running the 5K component of this year’s Eagles Autism Challenge, if I can find a few days of good health soon and start running again. I’m not too far from reaching my fundraising goal so a few more small donations should put me over the top. My son Benjamin and I greatly appreciate your support. Here are my key races for 2019…so far. They include another marathon, which will be my fourth (2 New Jersey Marathons, 2 Philadelphia Marathons), and my return to the Olympic-distance Atlantic City Triathlon (1-mile swim, 22-mile bike ride, 10K run). I did the Tri AC in 2014 and finished in 3:04:34, but that year’s edition included just a 20-mile bike ride and 5-mile run (although some believe they low-key added about a 1/4 mile to the swim portion that year). I am also interested in doing the Crest Best 10-Miler on October 13, but registration isn’t open for that yet. The same is true for the Broad Street Run on May 5, but by signing up for the Philadelphia Half Marathon using the “Philadelphia Challenge” option, I will be emailed a special registration link for a guaranteed spot in the Broad Street Run. Of course, now that I’m also doing the Eagles Autism Challenge 5K on May 18, that means I’m doing two running events in the three weeks following the New Jersey Marathon. That should be interesting for my legs. So much for recovery time! Other than these, there may be another 5K or two added to the race calendar. Barring any conflicts, I would like to do the WXPN Musicians On Call 5K in Philly in early October. I missed it this year because it was the same day as the inaugural Crest Best 10-Miler, which I opted to do instead. However, I think they will be a week apart in 2019.